Installing aluminum fences throughout the McLean, Arlington, Great Falls, Aurora Highlands, and surrounding areas in Northern Virginia. Many people in the Northern Virginia area choose aluminum fencing because of its high-end look and durability. At Carter Fence, we provide fast, friendly service and have been doing so since 1975. We have the experience and expertise to design and install your fence properly. Our experts can help you come up with the perfect fence design for your yard—and make sure it is aesthetically appealing as well. Contact us online or call today for a free estimate for aluminum fence installation—703-255-0824! Let Carter Fence help you save big on your next aluminum fence installation project or service! In addition to offering free estimates and on-site project consultations, we have great savings, too. Don’t forget to check out other ways you can save! Beautiful – aluminum fences are undeniably beautiful—they add a refined look to any backyard, and they can be customized to perfectly suit your tastes and style. Check out our images below to see some examples of the gorgeous aluminum fences we have installed. Durable – you can depend on your aluminum fencing for years to come because aluminum is strong, and it doesn’t rust. Low-maintenance – unlike iron, which can rust and requires a lot of maintenance, your aluminum fencing shouldn’t require very much maintenance to keep it looking as beautiful as the day it was installed. Affordable – aluminum fencing costs a lot less compared to traditional wrought iron, but aluminum can still add high-end beauty to any yard. Secure – aluminum fences are much more difficult to scale than a traditional wood fence—especially because most aluminum fencing is over 5 feet high. Contact us today to schedule a free consultation and find out if aluminum fencing is right for you! 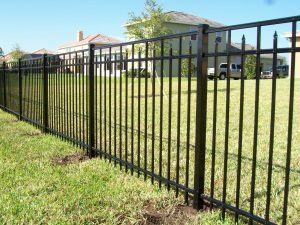 If you want to install aluminum fencing in your Northern Virginia yard, contact Carter Fence today for service you can depend on. Our talented team has been servicing this area for over 27 years, and we look forward to serving you, too. We’ll set up a free consultation and discuss all your options, including design, layout, and more! Contact us online or give us a call at 703-255-0824 to schedule your free consultation.